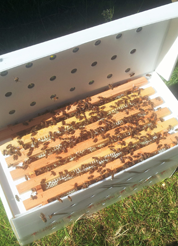 We recommend using disposable gloves for hive inspections. They not only protect your hands from propolis, they also reduce the risk of spreading disease throughout your apiary. These can be worn over the leather gloves if you prefer more protection. These are high protection Ultragrip Blue Nitrile 5ml disposable gloves. They are comfortable and slightly thicker than the average disposable glove. Each box contains 100 gloves, 50 pairs. Latex free and powder free. If you prefer a longer cuffed glove you ca purchase them here or you can wear our gauntlets with these to give extra protection around the wrist.